If you listen to many political pundits you may be under the incorrect assumption that the term rhetoric means bulls***. It doesn’t. I can promise you that when Aristotle wrote The Rhetoric in the 4th century BCE, he wasn’t referring to empty soundbites. Rhetoric is the study of how we, as speakers, engage in persuasive communication. Today, Congresswoman Gabrielle Giffords (D-AZ) was literally shot in the head at a “Congress on Your Corner” event in Tucson. Giffords was a ‘target’ in material provided by Sarah Palin’s political action committee in March 2010. 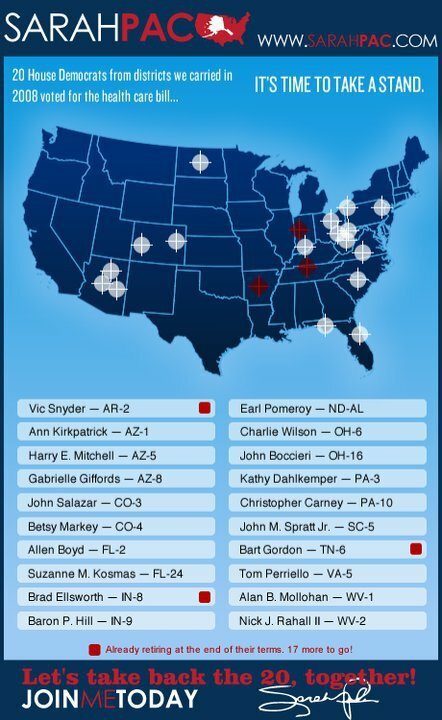 Looking at the graphic below, I think it is obvious that Palin’s “Don’t Retreat. Reload!” rhetoric isn’t b.s. It may have, in fact, been taken literally. Let us keep the deceased and the recovering in our prayers and petitions. Pima County Sheriff Clarence Dupnik, in a press conference about the shootings said this: “Let me just say one thing, because people tend to poo-poo this business about all the vitriol that we hear inflaming the American public by people who make a living off of doing that. That may be free speech. But it’s not without consequences.” Just as the military is quick to remind us that freedom isn’t ‘free,’ the freedom of speech carries a price as well. This entry was posted in Headlines and tagged Fringe, GOP, Guns, Politics. Bookmark the permalink.